Free Shipping Included! Corded Tulle With Sequins Communion Dress (7) by Lito at Blood of The Young. Hurry! Limited time offer. Offer valid only while supplies last. 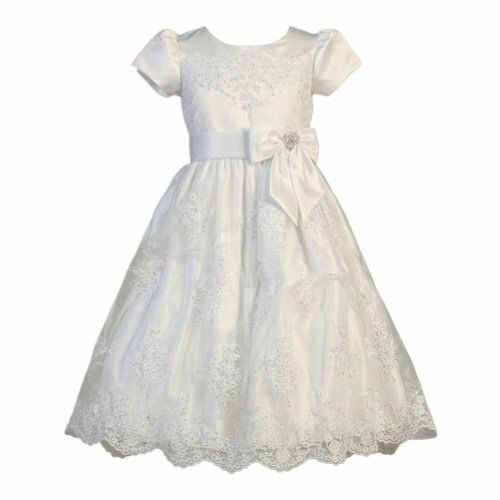 Stylish Communion dress from Lito for a pristine and elegant look. Short sleeved gown in white color with corded tulle and sequins on satin bodice. Stylish Communion dress from Lito for a pristine and elegant look. Short sleeved gown in white color with corded tulle and sequins on satin bodice. Satin waist trim and satin bow with rhinestone brooch accent. Scalloped hem and tea length. Made in USA.